Polished 10K Solid Yellow Gold Plain Tube Cross Baby Charm Necklace (S-1.15'') (18) by Religious Jewelry by LABLINGZ at Blood of The Young. MPN: ZM1550SNY-10K. Hurry! Limited time offer. Offer valid only while supplies last. 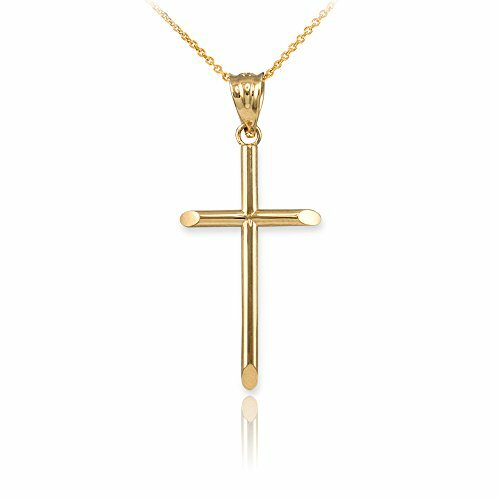 Solid Gold Plain Tube Cross Pendant Necklace. Metal: 10k Yellow Gold. Children's size (small). Necklace weight: 1.8g. Charm height (w/ bail): 1.15''. Solid Gold Plain Tube Cross Pendant Necklace. Charm height (w/ bail): 1.15". 10k Yellow Gold Tube Cross Baby Charm Necklace (1.15"). If you have any questions about this product by Religious Jewelry by LABLINGZ, contact us by completing and submitting the form below. If you are looking for a specif part number, please include it with your message.